This is another recipe from my Pinterest Board. 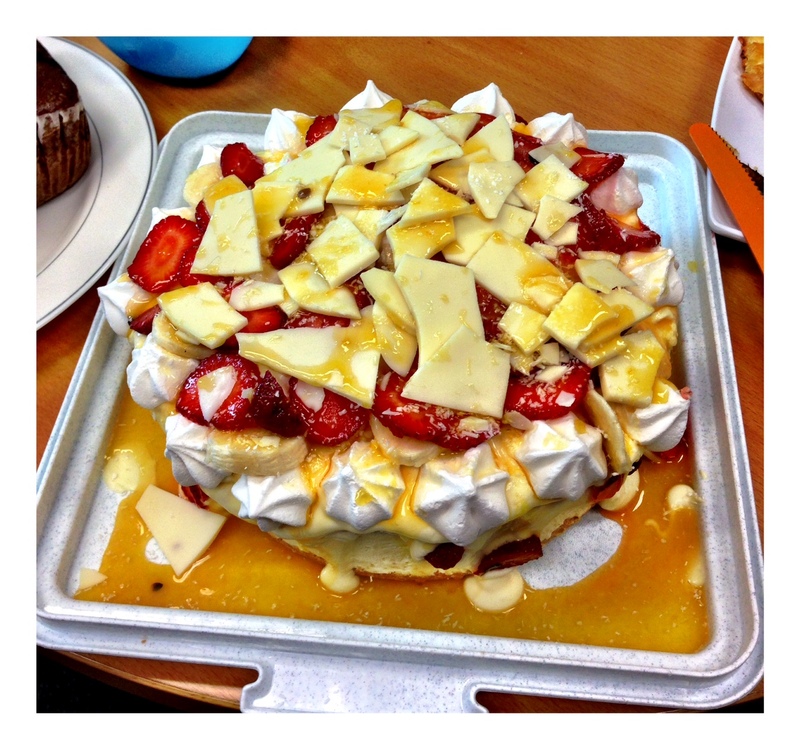 It is a dessert that is both a cheesecake and a pavlova – when I saw it I thought brilliant! Ed Halmagyi is an Australian chef, TV presenter, author, and radio host. I pinned this sometime in late 2013 and when I produced it for friends, I was inundated with compliments and requests to make it again. I found it way too sweet (unbelievable as I’m usually all up for sugary delights) and confusing – there was too much going on and I think it bamboozled my tastebuds. I did however like the freshness of the fruit and the crunch of the meringue. The combination with the creamy cheesecake just made it too rich. The best thing about this fancy dessert is that you don’t have to cook a thing. It is either bought (the biscuits for the base and the meringue) or refrigerated. You will however, have to use a hand mixer but other than that it is a great one for the kids to help you with. Grease base and side of an 18cm round pie tin with oil. Line with two 5cm-wide strips of baking paper to create a cross; leaving an overhang (this will help you lever the cake out of the tin when set). Line base with a round of baking paper. To make base, put biscuits in a food processor and pulse until fine crumbs form. Add butter and pulse until combined. Using the back of a large spoon, firmly press crumb mixture into the base of the prepared tin. To make the filling, put cream cheese in a large bowl and beat, using an electric mixer, until smooth. Add condensed milk, 1 can at a time, beating between additions until combined. Add lemon juice and beat until combined and thickened. Spoon all filling over base and smooth surface. Chill for 8 hours or preferably overnight until set. Carefully remove cheesecake from tin, using paper stirps to help you. Transfer to a cake stand or serving plate and smooth edges with a spatula. Spoon cream over cheesecake. Top with meringue and fruit pieces. Drizzle with passionfruit to serve. Taste Rating: – Not to my liking. I always make sure I have guests or friends coming over or I take it to work and get those I work with to try it out. The people I work with are my best guinea pigs – different ages, tastes, backgrounds and culinary upbringings. It is the perfect feedback environment. I usually take it to work or invite people over for dinner otherwise I’d need four stomachs like a cow and a much bigger fridge!